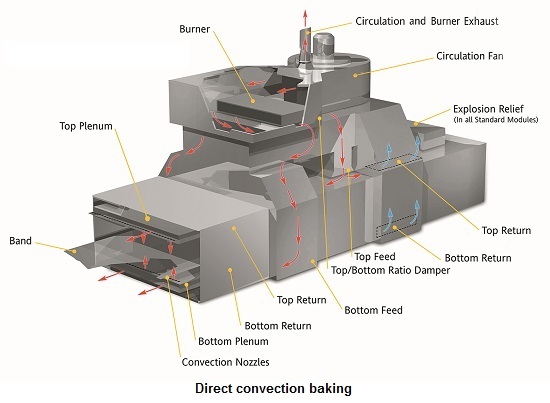 Since the introduction of indirect convection ovens, the perception has gradually taken hold that they are more efficient than direct convection ovens. In fact, the only reason for choosing indirect convection is if a stable supply of clean fuel is not available and oil has to be used. The misconception is based on the fact that the products of combustion entering the baking chamber in a direct convection system contain water vapour so extraction rates have to be increased to compensate. This, the theory goes, means that you are extracting more heat than is necessary, so efficiency must be lower. The reality is quite different. Firstly, in a direct convection oven, only 10% of the moisture comes from the burner. The remaining 90% comes from the product. Admittedly a little extra air has to be extracted, but this is more than offset by the efficiency differences. In a direct convection oven all the energy from the burner goes into the baking chamber: in an indirect convection oven approximately 20% to 30% goes up a flue because the heat exchanger is not (and can never be) 100% efficient. So which is more efficient: sending heat up a burner flue before it even gets to the baking chamber, or using it to heat the product and then extracting a small proportion? Clearly, direct convection is the clear winner in this regard – but there are a number of other factors in its favour also. The heat capacity of moist air is higher than that of dry air. 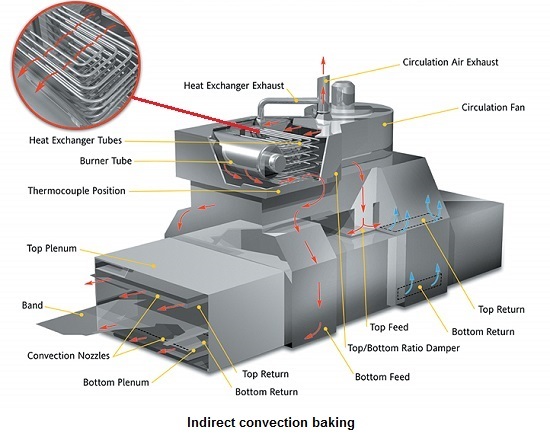 For a given heat flux, an indirect convection oven will have to use higher temperatures, which not only lead to higher losses but make the baking process less flexible and harder to control. A direct convection oven can be run at a lower and more economical temperature because the heat flux is higher. The effect is similar to a sauna where electric heating makes the air very dry. This dry air, at over 1000C, is hot but does not burn. Adding a ladle of water increases the humidity and immediately it feels much hotter. The temperature has not changed but the rate of heat transfer has increased dramatically. More electrical power is needed in an indirect convection oven because forcing the air through the heat exchanger increases the resistance of the air circuit. As a result, a larger fan is required to generate the high air impingement velocities necessary to achieve the required heat flux. In addition, the operational power of heat exchangers is limited, which places a restriction on the maximum length of the zone. To achieve the same total heat flux (energy input) as an indirect oven over the same length, additional zones may be required. There is also the reliability of the heat exchanger to be considered. A welded assembly subject to high temperature and thermal stresses is a recipe for leaks. When they happen they are difficult to detect, expensive to rectify and may result in damage to a lot more than just the heat exchanger. So the upshot of all that is that there is really only one reason to choose indirect convection: and that is only if oil is your fuel of choice or necessity.